Those two little words on Toys R' Us' website in regards to the Grand Emporium (10211) sparked a minor uproar recently among Lego investors. What does this mean? Will it change the Emporiums expected immanent retirement? Will 10211 languish forever at inflated TRU prices post EOL ala' Vampyre Castle? Should we all dump our large and exclusive sets in favor of poly bags and mini figures? Breath people, take a step back and chill. I, humbly, submit that it will have no impact what so ever. First the obligatory history lesson. Released in 2010 Grand Emporium (10211) is part of Lego's modular building line. It has 2,182 pieces and comes with 7 mini figures, all for a MSRP of $149.99. 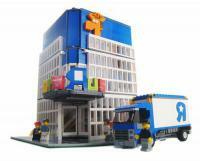 As of the first quarter of 2014 it is considered among the favorites to be the next modular to be retired by Lego, and as a corner building and large exclusive the set is expected to perform well post EOl. While TRU may consider The Emporium to be theirs, Wal Mart and Target may beg to differ. 10211 is available on both their websites, although Target has it listed for $159.99. (As of mid April 2014) This may be residual warehouse stock that needs to sell through but, I find that unlikely as the set has gone OOS at Target at least once since the TRU exclusive designation. It is also still available at S@H for regular retail, currently back ordered, but can still be purchased. There is precedence for TRU making an exclusive out of a large, close to EOL, set that was previously more widely available. Set 9468, Vampyre Castle, from the Monster Fighters line was a widely available set that drew the "Our Exclusive" badge at TRU close to EOL. 9468 was also expected to perform well after retirement, but hasn't done as expected. First off, Vampyre Castles' official retirement date is February 1, 2014. Given the very brief time frame and TRU's inflated prices this set simply has not had sufficient time to sell out, it cannot and will not appreciate until that happens. Second, it's only been retired for two months. Patience, wait it out. 9468 had an MSRP of $99.99, TRU has it for $109.99. Vampyre Castle is no longer in production, so whatever stock that TRU has is it. In this case OOS on TRUs website is the new "retired". The other side of this is the Technic line which had been a TRU exclusive for many years until very recently. Anyone invest in Technic while TRU was its sole US seller? Of course and with some very nice returns. Unimog, tracked crane, or quad bike anyone? The whole point of this is to not over react. TRU keeping a modular alive a few extra months in no way will harm your future returns. Will this continue with other modulars? Only Lego and TRU know that answer. i don't know... i'm from the old school of supply vs demand. the longer a set is out, the higher probability of a bad post-EOL period. popular themes like building modulars and winter / holiday are safe since they have ample demand. these near retirement TRU exclusives means collectors have more time to buy it even at inflated retail prices instead of the secondary market. the vamp castle is doomed for the foreseeable investment future since not many are buying it at $109. the GE is a diff story though as it will still sellout even at a slight mark-up. i liken TRU to a high supply with a low buy-in (cost) ticket scalper with these sets. won't matter in the long run. It's just a matter of time before TRUS goes under.